A hitherto unrecorded color-printed copy of the design on plate 20 of The Marriage of Heaven and Hell has turned up in a British private collection.1↤ 1 Henry Wemyss of Sotheby’s, London, kindly informed me about this work, allowed me to inspect it, and supplied the photograph. The new discovery can be shown to have come from the second copy of the socalled “Small Book of Designs” and confirms recent discoveries made about the color-printed designs by Robert Essick and Joseph Viscomi. It will perhaps be helpful to draw these discoveries together and examine their implications. In the first place it is clear that the new print is a second pull of the parallel design in the first copy of the Small Book of Designs in the British Museum.2↤ 2 Martin Butlin, The Paintings and Drawings of William Blake (New Haven, CT: Yale UP, 1981) 134, no. 260 6. References to this catalogue in the rest of this article will be given in the form “B260 6.” The coloring is identical though somewhat thinner, with the tone of the uncovered paper showing through in places. Essick has shown that, in the case of the Large Book of Designs, three of the duplicates are second pulls from the first copy in the British Museum, B262: Albion Rose, The Accusers of Theft, Adultery, Murder and Joseph of Arimathea Preaching to the Inhabitants of Britain, B284, 285, and 286.3↤ 3 Robert N. Essick, The Separate Plates of William Blake (Princeton, NJ: Princeton UP, 1983) 25 no. 1B, 32 no. 2E, and 44 no. 1B, respectively. To these Viscomi has added A Dream of Thiralatha, B267, and the frontispiece to Visions of the Daughters of Albion, B264, and Ted Gott has added Urizen plate 21, B281.4↤ 4 Joseph Viscomi, “The Myth of Commissioned Illuminated Books: George Romney, Isaac D’Israeli, and ‘ONE HUNDRED AND SIXTY designs . . . of Blake’s,’” Blake 23 (1989): 72n38; Martin Butlin and Ted Gott, William Blake in the Collection of the National Gallery of Victoria (National Gallery of Victoria, 1989) 110-11, both works reproduced in color. It is not always easy to make such assertions; at best most comparisons have to be made between a good color reproduction and an original. However, in the case of the Large Book of Designs it seems that, in fact, every case in which there is a duplicate, in other words every design except for plate 14 from Urizen, is a repeated pull from the same coloring.5↤ 5 There is an old color reproduction of 262 4 in Laurence Binyon, The Engraved Designs of William Blake (London and New York: Benn Press, 1926) pl. 49, which can be compared with B265 in the Tate Gallery, or the color reproduction of B265 (pl. 338) can be compared with B262 4 in the British Museum. 1. “‘O Revolving Serpent,’ Plate 20 of The Marriage of Heaven and Hell,” 1796. 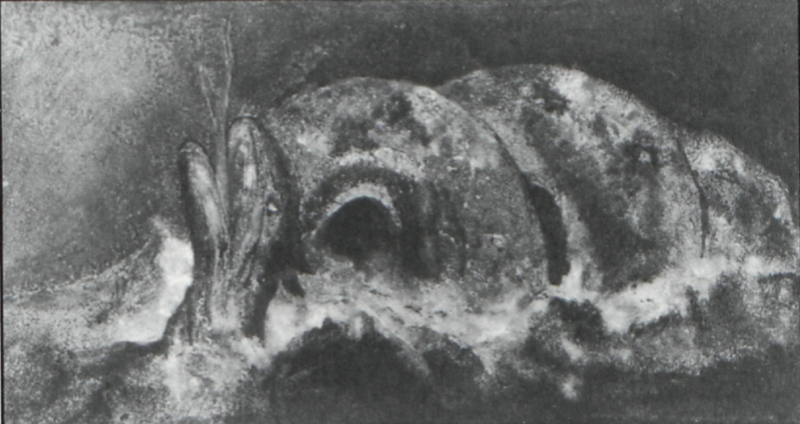 Color-printed relief etching finished in pen and water color, 5.6 × 10.3 cm. Private collection, Great Britain. duplication in the color printing means that both copies of the Large Book of Designs and of the Small Book of Designs must have been basically prepared at the same time, whenever the final finishing in pen and water color may have been done. This conclusion, so obvious once made, makes my suggestion that the two Small Books of Designs were printed in 1794 and 1796 respectively invalid. Moreover, if one can accept the date 1796 for the second copy of the Small Book of Designs, this invalidates my suggestion that the books of designs were intermediary between the use of color printing in Blake’s illuminated books and the totally independent large color-printed designs of “1795.”6↤ 6 Martin Bultin, “The Evolution of Blake’s Large Color Prints of 1795,” in Alvin H. Rosenfeld, ed., William Blake; Essays for S. Foster Damon (Providence, RI: Brown UP, 1969) 114-15. This theory made some sense in the conceptual and technical development of Blake’s use of color printing but is certainly not essential for Blake’s development; indeed, the experiments in the books would have been sufficient to produce the independent large prints. Whether one can rely on Blake’s dates with regard to his color prints is another question. It has already been shown that a number of the “1795” prints were actually executed in 1804 or 1805.7↤ 7 Martin Butlin, “A Newly Discovered Watermark and a Visionary’s Way with his Dates,” Blake 15 (1982): 101-03; Martin Butlin, “Paintings and Drawings of William Blake: Some Minor Additions,” Blake 17 (1984): 159; Martin Butlin, Tate Gallery Collections: Volume Five: William Blake 1757-1827 (London: Tate Gallery, 1990) 83, 90 no. 28, and 92 no. 29. Moreover, Viscomi suggests that the 1796 date, created by altering the “1794” on the title page of Urizen (B260 1 and B261 1) was done late in Blake’s career, when he added the framing lines and verses characteristic of the second copy of the Small Book of Designs. By this time Blake could well have wished to establish an “ideal” date for the separate designs. I leave it to other scholars to explain the significance of the second line and its relevance, if appropriate, to the begin page 20 | ↑ back to top Arlington Court picture, B803. It is generally assumed that Blake himself added these inscriptions when he issued the second copy of the Small Book of Designs. They seem to be in the same ink as the framing lines, which, as Viscomi points out, are very close to those added to All Religions are One Copy A, and Songs of Innocence and of Experience Copy R, presumably at the time that they were sold to John Linnell.8↤ 8 G. E. Bentley, Jr., Blake Books (Oxford: Clarendon P, 1977) 85-86 and 420. In addition, Viscomi has kindly let me know of his conclusions concerning these, copies, to be set out in his forthcoming book. Incidentally, the two designs from the second copy of the Large Book of Designs in the Tate Gallery, B264 and 265, also have framing lines similar to those that characterize the second copy of the Small Book of Designs. Another characteristic of some of the designs from the second copy of the Small Book of Designs is a small page number in the top right-hand corner. These are found on B261 3, 6, 7, and 9. A similar number, in this case “16,” is found on the newly discovered design. The other numbers so far discovered are “9,” “13,” “20” and “22.” This suggests that there may be ten more designs still awaiting rediscovery, a very exciting prospect. There are, of course, 23 designs in the first copy of the Small Book of Designs but the two books cannot have been identical: three designs from the second copy, B261 9, 10, and 11, are of subjects not found in the first copy. The possibility of missing designs is reinforced by the fact that four of the designs from the second copy show stab holes from a former binding, B261 2, 5, 6 and 8;9↤ 9 Bentley 357. the absence of such stab holes on other designs can be accounted for by the trimming of the paper. This binding must have been done before the second copy was dispersed. The early history of some of the designs is not known but B261 1 was given by Mrs. Blake (who died in 1831) to Frederick Tatham, B261 5 belonged to Samuel Palmer’s cousin John Giles, while B261 3 seems to have belonged to John Varley who, as will be shown, also owned the newly discovered design. A. White is presumably the Adam White who, according to inscriptions on the back of a counterproof of the Visionary Head of Wat Tyler (B740), was given that drawing by J. W. Lowry; the drawing had originally “belonged to Varley the artist whose wife was Miss Lowry.” White also owned a number of other Visionary Heads (B711, 712, 718, 736, and 760), one of which, Pindar and Lais the Courtesan, now in the Harris Museum and Art Gallery, Preston (B711) is inscribed, in similar fashion to the new color print, “Adam White from Mr [or more likely “Mrs”] Varley.” In addition one copy of the fourth state of the engraving by Blake and John Linnell after Linnell’s portrait drawing of Wilson Lowry is inscribed “To Adam White with J.W. Lowry’s regards 1854.”10↤ 10 Essick 204, no. 4M. The Miss Lowry who married Varley was his second wife, Delvalle (born c. 1797-1800), the daughter of Varley’s friend Wilson Lowry (1762-1824) and his second wife Rebecca Delvalle (1761-1848) whom he married in 1796. Delvalle married Varley in 1825. The Blake connection was strengthened by the fact that Wilson Lowry had engraved a number of the plates for Abraham Rees’ The Cyclopaedia, 1820, for which Blake also executed seven plates, one page being made up of engravings by both artists.11↤ 11 Essick 207-08. For help in unravelling the family relationships of the Varleys and the Lowrys I am indebted to my former colleague Anne Lyles; see also C. M. Kauffman, John Varley (1778-1842) (London: Batsford and Victoria and Albert Museum, 1984) 58 and 132. The mid nineteenth-century owner of this design was Sir Joseph Nöel Paton, RSA (1821-1901); it was probably he who added the inscription about the technique of the print. Through his father he became an admirer of Blake’s work, both his poetry and his designs, at an early age, and some of this influence remained with him throughout his life. As he said, his father taught him to “put the thought before the thing, and encouraged me in perpetual scribblings at subjects, instead of obliging me to copy objects.” Even a late work like Ezekiel of 1889-91 still reflects the influence of Blake both in the pose, close to that of the Dance of Albion, and in the bearded old man type used for Ezekiel.12↤ 12 For this particular work, and Sir Nöel Paton in general, see David and Francina Irwin, Scottish Painting at Home and Abroad 1700-1900 (London: Faber, 1975) 288-95; see also the Dictionary of National Bibliography. In 1845 Paton won a premium for the competition for the decoration of the new Houses of Parliament and in 1847 and 1849 came his two large pictures of fairy subjects, the works for which he is probably best known, The Reconciliation of Oberon and Titania and The Quarrel of Oberon and Titania, both now in the National Gallery of Scotland. He also painted such subjects as The Spirit of Religion (for the Houses of Parliament) and the Pursuit of Pleasure of 1855. He became an Associate of the Royal Scottish Academy in 1847 and a full member in 1850. He was appointed Her Majesty’s Limner for Scotland in 1865 and was knighted in 1867. He also published two volumes of verse. He knew Millais (an associate of the Rossettis in Preraphaelite days), Ruskin and the brothers David and William Bell Scott, these being further links with the circle of Blake admirers in the middle of the nineteenth century. It is nice to be able to identify at least one work by Blake that he owned.